Every month contains an action shot with head shot of famous drivers of the past. Bud was the premier photographer and you will love his black & white photos. This calendar series has become a collector's item. Drivers shown are Larry Crockett, Jimmy Bryan, Ted Horn, Joe James, Bob Sweikert, and Pat O'Connor. 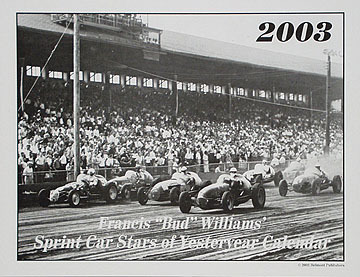 Other photos from other photographers are drivers Jud Larson, Bob Carey, Jim Hurtubise, Don Branson, Tommy Hinnershitz, and Jan Opperman are included. This calendar is dedicated to the memory of Bob "Rob" Stolze.